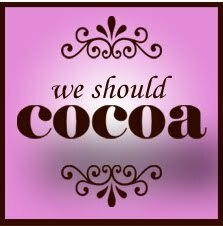 I was thrown a little by the theme for this month's 'We should Cocoa', (the blogger challenge run by Choclette at Chocolate Log Blog and Chele at Chocolate Teapot) it's Chocolate and Cheese! I've been mulling this over since it was announced, trying to think what I could make. Then I remembered the ricotta and chocolate filled cannoli that my SIL used to bring to us from a Sicilian Bakery in Edinburgh. I did a bit of research online, but decided that, rather than making the biscuit shells, I would use filo pastry. I bought the pastry and then it occurred to me that I had no idea what I would use to create the tubes...but you will see that I did manage to come up with something. You can get two large cannoli from two sheets of filo pastry, they did come out quite large but would be quite fiddly to make smaller. Heat the oven to 200C or 180C (fan). Lay out one sheet of filo, brush with melted butter and lay another sheet on top. 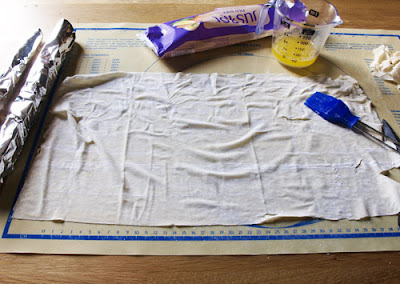 Using a small plate, cut out two circles per sheet, or more if you are making them smaller. Brush them with more butter. 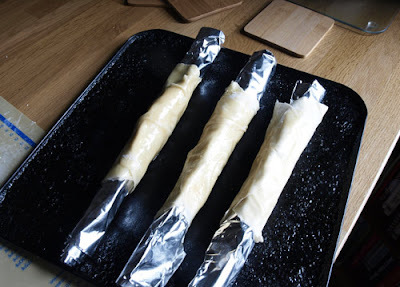 So here is my solution for making the cannoli tubes, rolled up aluminium foil! Roll the circle round the foil with the butter side out and bake in the oven for about 10 minutes until the tubes are golden brown. Leave to cool then carefully remove the foil. Mix the ricotta, 25g of the chocolate, the Amaretto and the sugar. Fill a disposable piping bag without a nozzle and snip off the end. Fill from both ends with the cheese mixture. Melt the rest of chocolate in a bowl over a pan of simmering water and dip the end of the cannoli into the melted chocolate. Place onto a plate covered with baking paper and place in the fridge for about an hour until the chocolate and filling are set. Dust with icing sugar. I was really pleased with the way the Cannoli turned out, they were totally delicious, the crunch of the filo and the soft sweetness of the ricotta mixture with a hit of dark chocolate. These ones were a little on the big size, so I may try and make some smaller ones in future. Cannolis are one of my favorite things in the world. 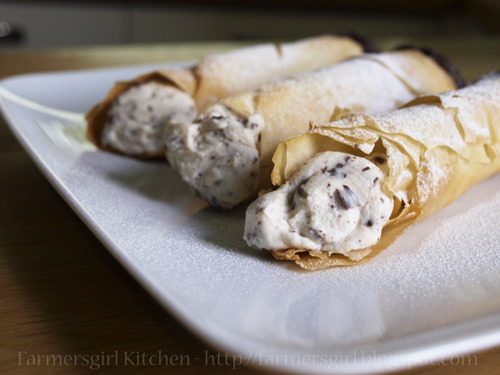 But, I've never made them because of the cannoli shell. 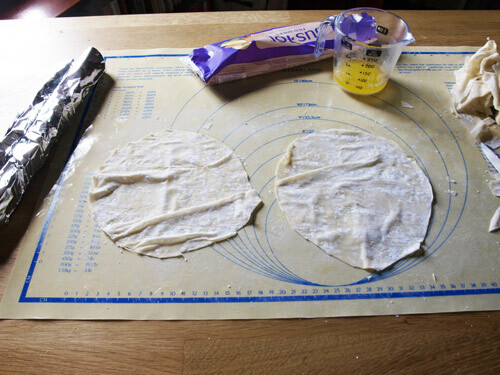 You have totally opened my world by using the phyllo dough! Great job! Oh brilliant, just love this Janice. I'm impressed with your resourcefulness and dedication. And they sound delicious too - lovely combination. Thanks for entering. holy bejoly these are STUNNING!!!! STUNNING!!!... I need it NOW... obviously NOT on my diet but whatchyagonnadoeh? 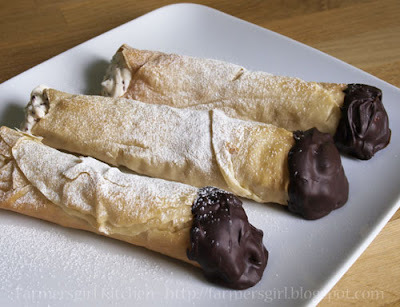 Great idea to use the filo - they look delicious. I like your use of foil - it's a lot cheaper than the cannoli moulds I've seen but probably just as effective. I love how creative you've been to make these. They sound really delicious. They look amazing - especially dipped in chocolate! Thanks for all the lovely comments. Definitely not for the Food Bloggers Diet, but worth every bite. Would love to see someone have a go at making them, let me know if you do. Oh, wow! What a great take on the chocolate and cheese combination! I sort of wish I hadn't seen them as I know I'm going to have to try, haha! Love the blog. Always interesting posts and I learn something new every time I visit you. That looks fantastic! You're mixing my two favourites together. I have to try this one at home. Hannah - I'm sure you will come up with something really good. Marcus - will check that out! Lucy - the mat comes from Lakeland Limited, I got it for my Christmas! Ah Ros, I'm afraid they are long gone! FABULOUS idea and such lovely step by step photos too! Great entry Janice.